YES played two concerts in Caracas Venezuela in the Teresa Carreno Theater and is not here...why?????? Howe doesn't want to play YesWest or _OYE_ material and seems to have gotten his way. Early leaks suggested *four* YesWest songs and we've actually got two. Anderson is clearly still opposing _Drama_ material despite Howe, Squire and White being keen. Squire is presumably blocking _ABWH_ material despite Anderson being keen. White, Howe and Khoroshev all seem to back _Relayer_, but it's not getting played. Howe was very keen on doing "Mind Drive"; Squire wasn't. Howe and others have hinted at playing Banks-era material but no. It appears that Yes will *not* be playing "Mind Drive" on tour this summer. Anderson and Howe wanted to, but the others had problems playing it. They'll be playing "Yours is No Disgrace" instead. YES will be creating an experience of a lifetime in America's amphitheaters this summer as they continue their Open Your Eyes World Tour celebrating 30 years of the YES experience. YES consisting of the classic line-up: vocalist Jon Anderson, guitarist Steve Howe, bassist/vocalist Chris Squire, drummer Alan White and new guitarist/vocalist Billy Sherwood, will kickoff their North American Tour in Toronto at Molson Amphitheatre on June 18. The Open Your Eyes Tour experience will feature a unique surround sound technology in the amphitheater setting. According to Greg Hall, president of the renowned sound company, Clair Bros. Sound, "YES pioneered concepts in the live concert arena that are now second nature to touring artists and continue to do so." The set and lighting design of the tour was created by John Broderick and Jonathan Smeeton, whose credits include Smashing Pumpkins and Metallica and Peter Gabriel and Journey, respectively. YES will be releasing a surround sound CD on May 5 distributed by ADA, to coincide with the surround sound tour. The album, will feature music from the Open Your Eyes release, but with the special encoding as designed by SAIL (Seattle Audio Imaging Labs) Sound to produce the surround sound. Currently the band is on a sell-out tour of Europe and receiving rave reviews including this quote from Kerrang! Magazine, England's leading rock magazine, "There is a verve, edge and freshness about the performance that makes it seem as if we've never heard `Siberian Khatru,' `Long Distance Runaround' and `Roundabout' before, even though they all date back to the early '70s." Slight update on Ivan's keyboard setup: He's also using a Kurtzweil (looks like a K2000). I think there is a real concious effort to keep Igor back in the mix since he has been real nervous doing his first show. ts got to be awesome playing with legendary musicians. Igor sounded real good on opening nite although he was buyed in the mix. In Boston the band did Heart of the Sunrise and at the break where Igor does the piano run he came in a little late and was a bit shakey prompting Steve Howe to turn and face him and give a little grin. [Ivan's] using a Nord Lead for the analog parts, some kind of weighted key master controller (impossible to see which one from my vatage point) for pianos, and also split to do other stuff once in awhile. There are a few other keyboards, but I really couldn't tell what they were. 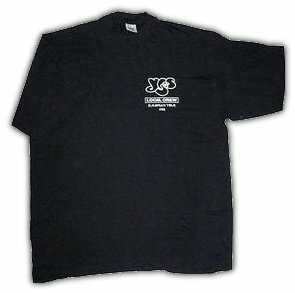 Besides the fact there was no music from 'Going for the One, I have to say that not allowing cameras and recorders into the building and yet accepting pot smoking up the place really puzzles me. Igor was average at best, his keyboard voices were ordinary, although, he did have a couple of promising moments - brief flourishes. Countless times there were moments when Rick's truely unique flair was noticably missing. For example , the classic organ break in "Roundabout", I'm talking quintessential YES!!! How can anybody not miss the finest musician on Earth??? Yes, art-rock's foremost purveyors, have reunited in the band's most classic lineup for a new album and North American tour. Vocalist Jon Anderson, guitarist Steve Howe, bassist/vocalist Chris Squire and drummer Alan White have entered the studio to create the first completely original Yes studio album with Howe to be available in the U.S. since 1980. 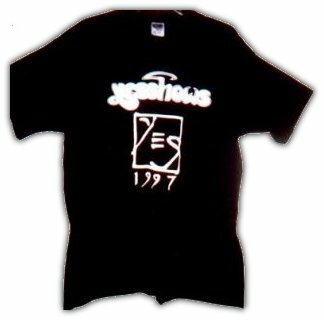 The new disk, titled simply YES, is due on November 25th on Beyond Records, distributed by Tommy Boy and ADA. Long-time cover artist Roger Dean is at work on the album design. In addition Yes associate and engineer Billy Sherwood will be joining the classic lineup on the new album and on stage. 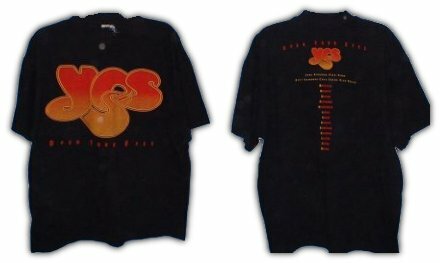 Yes is presently in rehearsals for its extensive North American fall "Open Your Eyes Tour" that will bring the multi-platinum band's multi-sensory experience into intimate theaters. The first two shows at New York's Beacon Theater and Philadelphia's Tower Theater sold out in just minutes. The tour kicks off on Fri., Oct. 17 in Hartford, CT, with stops at New York's Beacon Theater Oct. 28-30, Chicago's Rosemont Horizon on Nov. 13-14, and Los Angeles' Universal Amphitheatre on Dec. 7-8, before wrapping up at San Francisco's Warfield Theater on Dec. 12-14. A major feature of the Yes tour will be exhibitions of "Yesart" in theater lobbies. The band's album covers, most of which were painted by Roger Dean, will be represented in the "Yesart" exhibits, along with hand-picked Dean- and Yes-inspired art by fans of the band. The band itself will attend many of the "Yesart" displays, affording them the opportunity to meet fans old and new. Dean is also planning his own gallery exhibition in San Francisco to coincide with the tour's finale in that city in December. "Open Your Eyes", the first single from the new album hits rock radio on Sept. 29. It will be made available to fans for preview via the Internet. The band, always on the leading edge of music's intersection with technology, will announce more shortly. "This is another great chapter in the saga of Yes," says long-time member Chris Squire. "We came of age in the '70s and had a rebirth in the early '80s. And now with our new album, Yes, we're feeling stronger as a unit than we have in a long, long time. And I think it's going to be contagious."